We’d love your help. Let us know what’s wrong with this preview of Cassandra High Availability by Robbie Strickland. 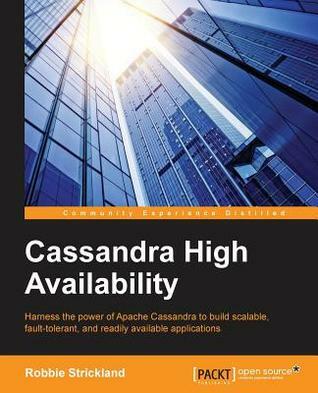 To ask other readers questions about Cassandra High Availability, please sign up. What is more important -> it's written in a VERY clear way & truly approachable. Some of the hints are quite well known (if you're interested in the topic), but some are true gems (I've learned a lot about how tombstones are handled, chapter about data modeling was very useful as well) & some are just very rare Solid book. What is more important -> it's written in a VERY clear way & truly approachable. Some of the hints are quite well known (if you're interested in the topic), but some are true gems (I've learned a lot about how tombstones are handled, chapter about data modeling was very useful as well) & some are just very rare (you don't find much information about them in other publications - for instance: backing up Cassandra). What DIDN'T I like then? * formatting on Kindle HDX 7 (mobi version) was terrible - font was huge & it decreasing it was not possible - Packt, do something with that finally! In general - I'd call this book "a decent version 2.0". Book is quite good, it starts with description of how Cassandra distributed model is organized, how requests are handled & related topics. Part of the book is dedicated to the discussion of the data model & how it affects the performance of the queries. Separate chapter is dedicated to the discussion of the antipatterns, and how to avoid such cases. Other chapters includes the administrative tasks & related topics. I would like to read more about data models for more use cases, as this is quite important topic. I maybe also exclude some of the basic-level sections, because this book assumes some knowledge of the Cassandra & CQL. Very well written and well structured book about Cassandra. Of course book is not for the entry level of Cassandra, but it's a must read book for Cassandra advance level. This book well explained Cassandra's Data Distribution, Replication and data modelling for high availability. Also chapter 6 introduce data stay java native client for working with Cassandra, which can be very useful for Cassandra beginners. I have written the full review of the book and you can find it here http://frommyworksh Very well written and well structured book about Cassandra. Of course book is not for the entry level of Cassandra, but it's a must read book for Cassandra advance level. This book well explained Cassandra's Data Distribution, Replication and data modelling for high availability. Also chapter 6 introduce data stay java native client for working with Cassandra, which can be very useful for Cassandra beginners. Very solid introduction to Cassandra database and no-SQL itself. The book contains many useful examples of how to model for high performance and availability, which is great! I would totally recommend this book to person who just started working with Cassandra, and those who want to increase performance of an existing cluster. it's written in a really clear way. Author did a great job explaining those complex concepts in a simple and clear language.